Top 10 Filler Flowers to Know. Your thinking babies breath right? The most popular filler flower around and it has recently seen a major come back but there are a plethora of blooms just like babies breath that we use all the time to achieve that something extra. Sometimes you just need something ... something fluffy or airy or whispy or branchy or delicate or textured. Welcome to the world of filler flowers. Wax flower is the new babies breath (for us anyway). We love to use this flower in place of babies breath. Not only is it more in keeping with current trends and pairs well with other flowers but it is the exact same price as babies breath (babies breath is great too but works best as an element on it's own in large quantities). Available in white/ivory, fuchsia, peachy pink, pink and also a wide range of stem died varieties as well. A filler flower with some serious romantic qualities. If you love texture but want to keep your flowers soft and romantic then this is the bloom for you. We love to create a mono botanical bouquet of satiable blooms for bridesmaids or sweet flower girls bouquets. Consider a beautiful cluster of this element for a truly unique aesthetic. Available in white/ivory, the most perfect shade of blush, and a sangria wine tone. Most commonly known for its beautiful and vibrant magenta colored blooms, heather does also come in white. It's not widely used for wedding work but we would love to an all heather bouquet someday for a wedding... any brides out there? Heres one that combines airy and whispy and texture all in one. Ginestra is a lovely addition to centerpiece work when it fits into the aesthetic. Available in white, pink and also some stem died varieties. Ahhhh, bridal veil spirea. A personal favorite. Every year I try to incorporate this beautiful and truly romantic, sweetly arching, slightly branchy bloom into wedding work as much as possible. Something as simple as these delicate white blooms can make your bouquets feel freshly gathered out of the garden like nothing else could. Best bet for maximum quality is May, just before the weather really turns from spring into summer. We have recently been branching out (no pun intended) into the world of filler flowers to really see whats out there. To be honest, in my previous work experience (Yes, Oprah) I didn't have to use these guys much so it's actually been surprisingly fun to explore some fresh cut varieties I hadn't ever really used before. Calcynia is one of my fnew avorites for just the right amount of texture in centerpieces or for a slightly desert boho rusticity in bouquets. A little bit can go a long way with this bloom. Available in pink and white. What can I say about babies breath? We all know it. We all still have a place in our hearts for it. For me this blooms has to be used in just the right way to make it work. Generally, babies breath is one of those that I only use on it's own in large scale proportions. Also, it's not as inexpensive as many people think so I often offer other options in terms of "filling things out" if that is the goal. Another personal favorite is astrantia. What I love about this bloom is that it is the perfect bridge element to marry the recently popular wedding palette of marsala with blush and ivory. I find it can be a harsh transition for those colors to come together and I love using a filler flower like astrantia's mauve-y color to make that more seamless. They are available in mauve and white and have a slightly botanical texture to them. Twelve years as a florist and I just discovered Eupatorium recently on a Holland direct list. I took a gamble on it because it was sooo inexpensive at the time and the rest is history. Now I order this white filler blooms fairly regularly. It feels very similar to queen annes lace but what I love most about it is that it looks almost like a field flower so it adds a really natural and foraged aesthetic to arrangements. It seems to be available year round. Otherwise known as roadsidia (roadside - ia). Some florist humor for you there if you caught it. Anyway, this bloom is a staple in wedding work. 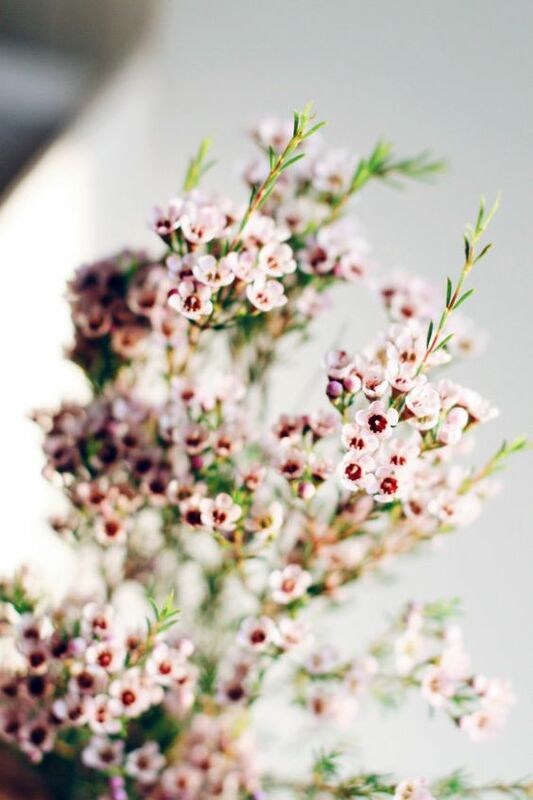 Though it's delicate blooms can be fleeting it's well worth the effort to incorporate these blooms if your wanting an element of airy and delicate for centerpieces or bouquets. Available year round. I hope you found this list helpful! There you have it, our Top 10 Filler Flowers for 2017! Stay tuned for more Flowers To Know posts. Next up we are covering our top picks for foliage. How to best incorporating the greens trend into your wedding day! The world of flowers is a beautiful one; full of amazing shapes, sizes, textures, shades upon shades of colors and lots of impossible sounding names to pronounce. So where do you start when looking into flowers for your big day? Pinterest is a great resource but they usually don't list the names of all the blooms you are seeing in each bouquet so it's easy to get overwhelmed. Thats why we wanted to provide you with a list of the Top 10 Focal Flowers to Know when planning your wedding. We will include lots of the key players in the world of wedding blooms as well as some of the more unexpected, novelty and "filler" blooms that are available for the brides who are thinking outside the box. By far the most asked for flower on the market. Available in a range of pink and white tones most commonly. Also popular are the "Coral Charm" peonies and some lesser known varieties include japanese tree peonies, and garnet peonies. Due to their huge popularity, the flower market has made these luscious blooms available from November through June, but may come with a hefty price tag, unless in spring when they're available locally. Not your average rose, these beautiful garden style rose blooms open like a peony and are often mistaken for them as well. Elegant and classic with soft, opened petals, they really bring the romantic element alive in bouquets. Although they are available in a wide range of tones, garden roses are becoming extremely popular with brides who are looking for the perfect shades of peach and blush tones. Our newest favorite variety is the "Romantic Antik". Available year round but at a cost of almost four times the price of a regular rose be careful not to fall in love with these beauties too quickly. In late summer these blooms can't be beat. Available year round and in a plethora of colors from vibrant tones to soft and romantic and even rich, dark shades. They are a perfect element to consider for brides who like a little texture. Readily available and at their best locally in September-October through local growers including farmers markets. Just be careful if you are DIY-ing with these beauties, they are fleeting when it comes to heat and processing. Best to get the day before your event and keep cool. Not all roses are made equal. Just as some flowers are more special than others, some roses are more special than others. The diversity in shape, size and colors when it comes to roses is pretty outstanding. Thats what makes roses such a versatile element to consider when planning wedding flowers. Over the years we've come to know our favorite varieties, roses that have the pretty to stand up to a peony or a garden rose. For white, you can't beat "Polo" roses and for blush, try "Sweet escimo" or "Faith" roses. Just a few of our favorites. I love these flowers because they pack such a punch all in one bloom. Used as a singular flower, they can be quite impactful. They are not for the faint of heart. Their organic, botanical, almost desert-like presence paired with the velvety dusty pink shade of their petals make them quite romantic and very in keeping with the current bohemian-inspired wedding trends we are seeing today. Available year round. I think the most common misconception I have experienced with clients over the years is that orchids are too expensive to consider so many people count them out right away. The truth is that in general, flowers are expensive, some more than others yes but orchids are by far and away not the most expensive bloom out there. First of all there are different varieties which vary in price. Next it's always important to consider how you want to make an impact in your bouquets? It through sheer quantity and size or through impactful thoughtout design elements that come together to create a stunning arrangement. I've always been a big fan or incorporating orchids into arrangements even if it's only one or two they make such a huge difference. They are available year round in such a huge variety of shapes and sizes. If your thinking about it ask you florist what they think about incorporating some into your flowers. These beauties are well known for being a favorite blooming bulb plant used during christmas time but they are usually available year round as cut flowers. With four large trumpet like blooms coming off of just one stem they have a wonderful dramatic effect. Available in a variety of colors and even a few unique shape petals you'll have access to blooms in white, deep garnet red, pinks, coral and even some variegated varieties. Although a little more expensive than other blooms they are well worth the cost for the sheer volume of these blooms is quite large. Most brides don't dream about daisies for their wedding day but the football mum is a type of chrysanthemum that is aptly named for it's dramatic size. The blooms are fluffy and really fun for a bride who wants a laid back and casual feel for her wedding day. The are wonderful all on their own but also pair nicely in a bouquet with other accent blooms. Recent popularity has fallen away from these flowers so availability is a little less than normal but should be available year round but especially in the late summer and fall. Available in white and yellow. In my experience this flower is one that people either love or hate but in general it has recently seen a drop in popularity as the current trend towards flowy gardeny blooms have taken root. The clean and vertical shape of this blooms lends itself well to being all on it's own in a cluster or used in a modern centerpiece design. Available year round and in a wide range of colors check it out and see if you like it. I couldn't resist including this very special bloom because of it's truly timeless quality. I often hear from brides that they may want to include this bloom for sentimental reasons or as a family tradition. And what a great tradition! Fragrant and luscious, the gardenia blooms are not necessarily a popular choice for many brides but for those who love it or for brides who want to infuse a timeless elegance into their event these blooms are worth incorporating. I once created an entire bouquet out of all gardenia blooms for a bride. I recall a florist friend of mine thinking I was crazy for working with such a sensitive flower... it was a little stressful, I won't lie but totally worth it! The bouquet was stunning and the bride was beyond happy. I hope you found this list helpful! There you have it, our Top 10 Focal Flowers for 2017! Stay tuned for more Flowers To Know posts. Next up we are covering our top picks for what we call "Complimentary Flowers".